An ICE spokesperson claims "his whole public persona is false"
Rapper 21 Savage has been arrested by U.S. Immigration and Customs Enforcement (ICE), which claims that he is a British national that has overstayed his visa. As Atlanta's WSB-TV 2 reports, the artist born Shayaa Bin Abraham-Joseph was taken into custody in the city this morning. A statement released by ICE alleges that Abraham-Joseph came to the United States legally in 2005, but failed to leave upon his visa's 2006 expiration. UPDATE (2/4, 5:31 p.m. EST): Attorney Charles H. Kuck of Kuck Baxter Immigration has released a statement on 21 Savage's behalf, revealing that the rapper has a pending visa application. They write, "the Department of Homeland Security has known his address and his history since his filing for the U Visa in 2017, yet they took no action against him until this past weekend." Read the statement below. UPDATE (2/4, 11:45 a.m. EST): CBS reports that 21 Savage was arrested as part of an operation targeting fellow rapper Young Nudy (born Quantavious Thomas). 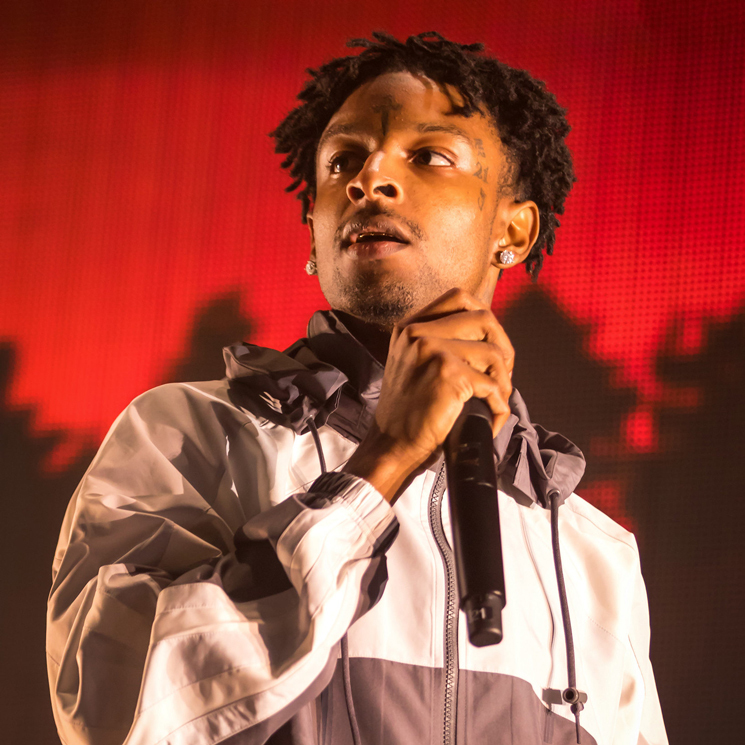 As Pitchfork reports, Thomas — who is also 21 Savage's cousin — was arrested and charged with aggravated assault and participation in criminal gang activity. U.S. Immigration and Customs Enforcement (ICE) arrested unlawfully present United Kingdom national Sha Yaa Bin Abraham-Joseph AKA "21 Savage" during a targeted operation with federal and local law enforcement partners early Sunday in metro Atlanta. Mr. Abraham-Joseph was taken into ICE custody as he is unlawfully present in the U.S. and also a convicted felon. CNN correspondent Nick Valencia was told by an ICE spokesperson that Abraham-Joseph's "whole public persona is false. He actually came to the U.S. from the U.K. as a teen and overstayed his visa." The rapper's attorney, Dina LaPolt, told TMZ, "We are working diligently to get Mr. Abraham-Joseph out of detention while we work with authorities to clear up any misunderstanding. Mr. Abraham-Joseph is a role model to the young people in the country — especially in Atlanta, Georgia and is actively working in the community leading programs to help underprivileged youths in financial literacy." Twitter user @goldlinkjonny pointed out that during a performance of "a lot" on The Tonight Show Starring Jimmy Fallon late last month, 21 Savage included new lyrics referencing the ongoing Flint water crisis and the United States' detention of migrant children. You can find the bars in question from the performance below. 21 Savage performed in Atlanta this weekend as part of the city's Super Bowl festivities. As a community figure in Atlanta, the rapper was recognized for holding annual back-to-school and financial literacy initiatives. He released his i am > i was LP in December of last year, and recently shared a video for the J. Cole-assisted opening track "a lot."